The best skiing on the East Coast of the USA tends to be overshadowed by the premier ski facilities you find in the resorts of the West Coast. There is plenty of variety and great skiing to be had at East Coast ski resorts. 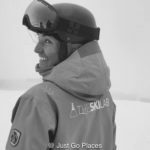 The best ski resorts in Vermont, ski resorts in Maine or ski areas in New Hampshire are snow sure and offer great skiing. 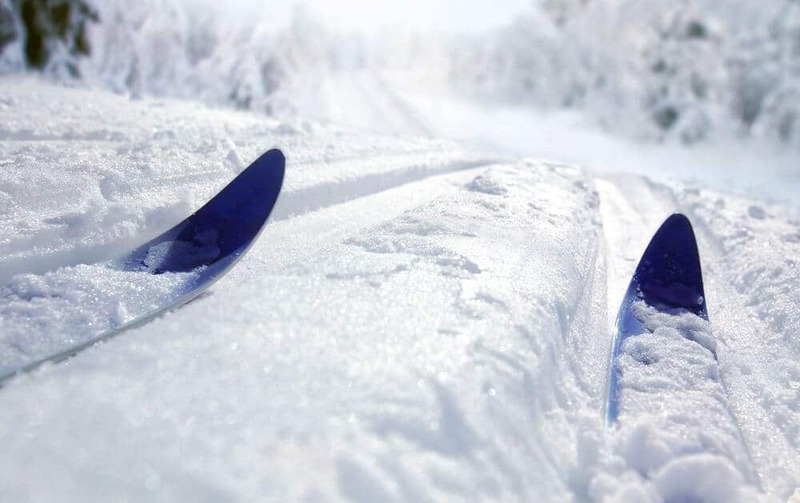 Moreover, many of the best places to ski on the East Coast are within a few hours drive of major metropolitan areas like Boston, New York, Philadelphia and Washington, D.C. After all the best ski resorts in Eastern US are the ones that you can actually access quickly and easily even for a weekend on the slopes. 5.2 Join our growing community of readers! So close to the Canadian border, you would expect ski resorts in Maine to have excellent facilities and to be snow-sure. And, your expectations will be met. So, what are the best resorts in Maine? The resort of Sunday River in Southern Maine is known for its reliable skiing. 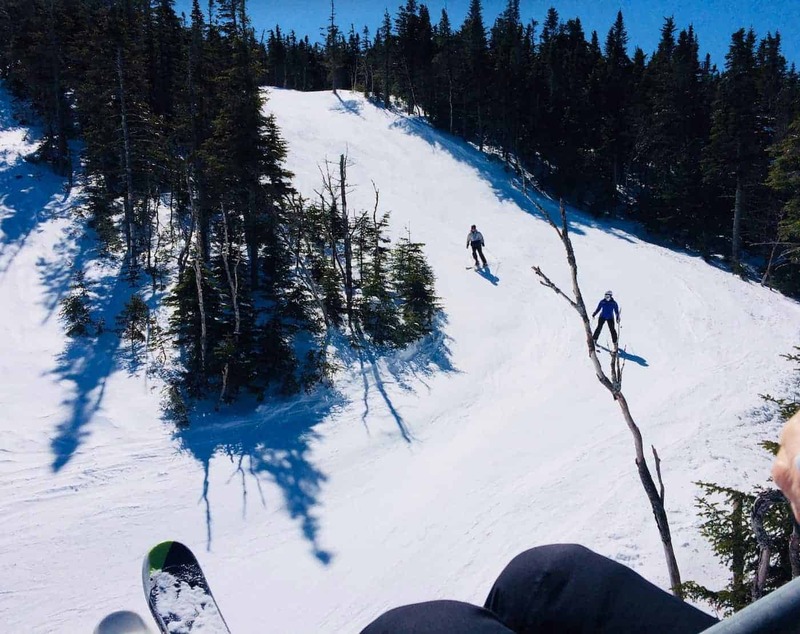 With nearly 750 skiable acres, this ski resort in Maine has 8 peaks, 131 trails and 18 lifts geared for all abilities of skier and snowboarder. 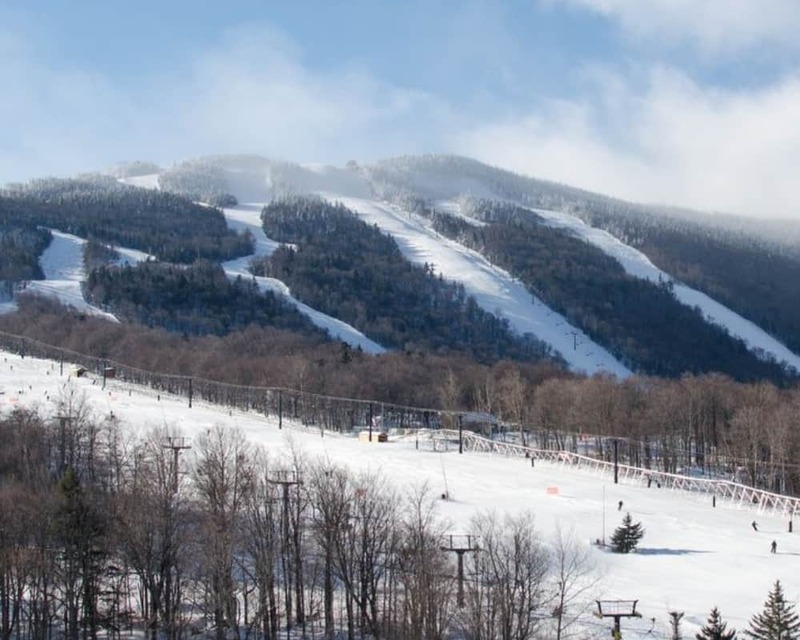 Sugarloaf ski resort in Maine is further north and has even more skiable terrain – a whopping 1150+ acres. You get some of the best American ski resorts in the Northeast. 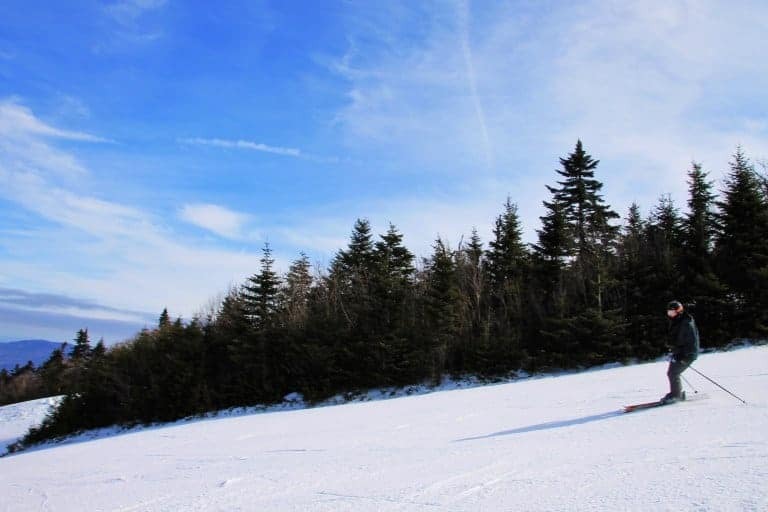 For beginner skiers and snowboarders, Saddleback is one of the best places to ski on the East Coast with extensive terrain away from more advanced skiers. In addition, the ski and snowboard school is well-known for its low teacher-student ratio. For weekend skiers, New Hermon Mountain is located outside of Bangor Maine. New Hermon has plenty of easy and intermediate runs set over 60 acres. More advanced skiers may not be challenged though. Also near Bangor is Shawnee Peak, the oldest ski resort in Maine, which is likewise one of the small but fun East Coast ski resorts. Check out Tripadvisor’s opinion of the best resorts in Maine for skiing and snowboarding. 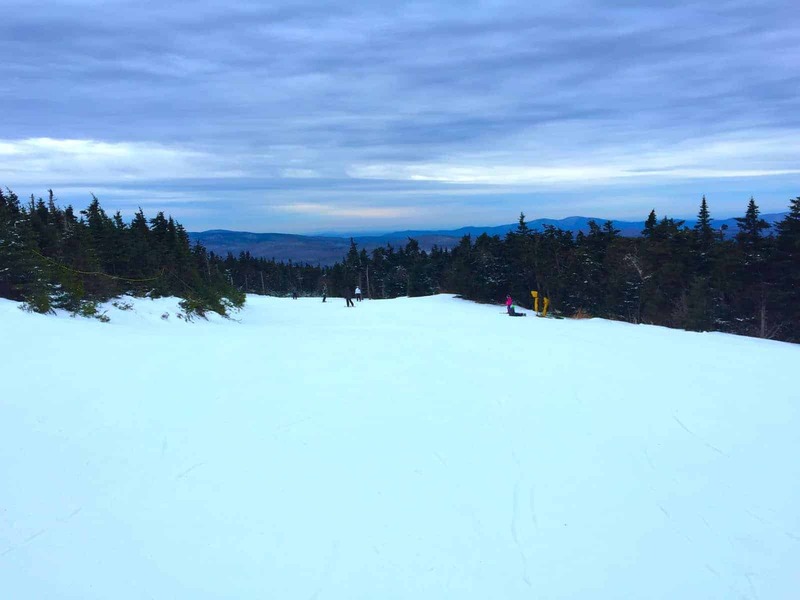 Here to give you her personal experience of Sugarloaf, one of the best resorts in Maine, is fellow travel blogger, Patti Neves at Tripping Unicorn. Sugarloaf is a ski resort located on Sugarloaf Mountain in Carrabassett Valley, Maine. Providing some of the best skiing on the East Coast, It is the second biggest resort of Maine. We stayed in a very friendly AirBnB, Mountain Village Farm B&B, where the owner raised ducks and prepared her own granola at home. We had also organic coffee and eggs from the farm’s own hens, blueberries pancakes and maybe the best oatmeal we ever had. There are plenty of nice cottages where you can stay in Kingfield – this area is just 18 Miles away from the Sugar Loaf resort. I highly recommend that place for a romantic get away and families. The resort itself is really cool, there were amazing amounts of snow, and the quality of the snow was good. The resort has 34 green trails, 44 blue, 39 black diamond and 21 double diamond. Is it good enough for beginners but also perfect to high level skiers. I would certainly bring kids there. The Sugarloaf season runs from mid-November through early May. The night life was nearly no-existent in mid-March, so I do not recommend the place for party animals. It is, however, one of the best ski resorts on the East Coast for families with kids. 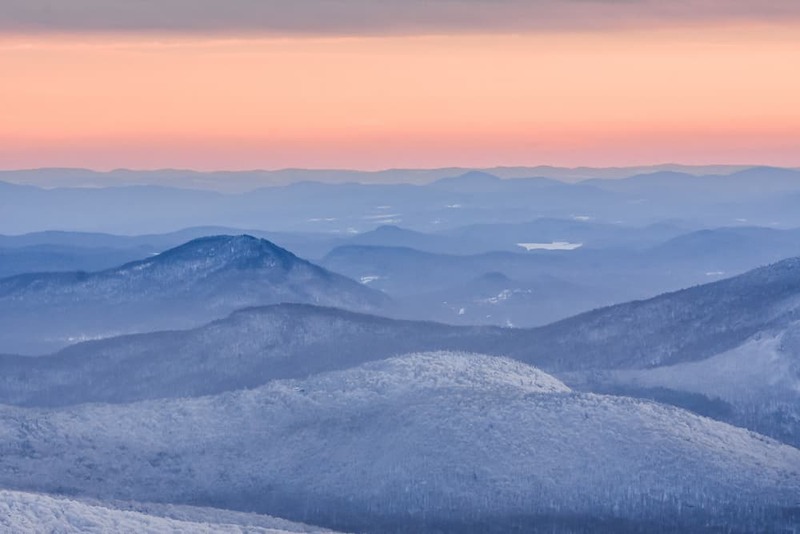 Some of the best places to ski on the East Coast are in New York thanks to the state having both the Adirondack as well as the Catskill Mountains. Fun fact! New York state has 43 ski areas of which 10 are ski resorts. The location for the downhill skiing events for the 1980 Lake Placid Winter Olympics, Whiteface Mountain is one of the best ski resorts on the East Coast. Whiteface has 86 trails and 280+ acres of terrain and as snow sure as East Coast ski resorts get. Gore Mountain is also located in the Adirondacks and one of the best ski resorts for families on the east coast. Greek Peak is also in central New York and is well known for being one of the best family ski resorts on the East Coast. With 38 trails over 220 skiable acres, 6 lifts and 3 terrain parks, Greek Peak has a good spread of choices for skiers of every level. The best ski resorts near NYC are located in the Catskills. Spread across three mountains, Hunter Mountain is a resort a couple of hours north of New York City. 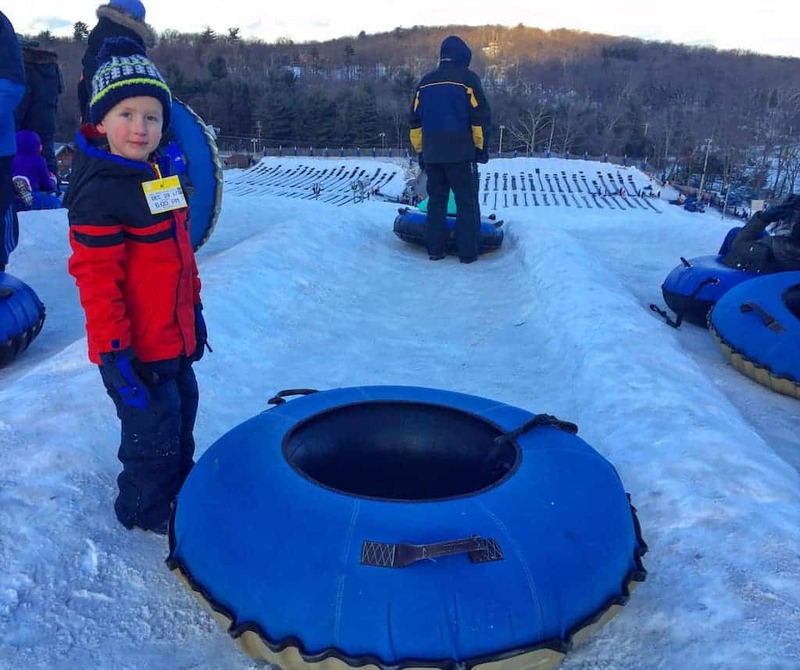 Families will love the snowtubing park at Hunter Mountain which is the largest on the East Coast. 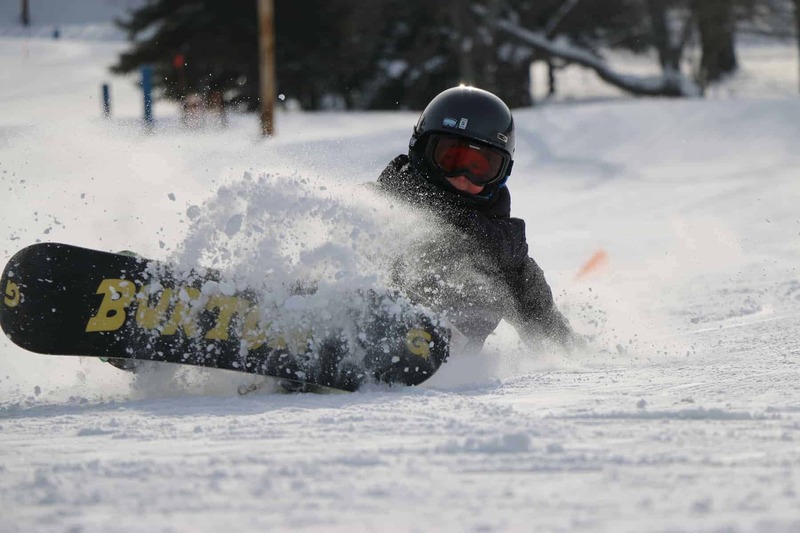 Windham Mountain is another one of the best ski resorts near NYC with 54 trails set over 285 acres. An hour from Buffalo and Niagara Falls and about three hours from Cleveland, Ellicotville has two of the best ski resorts in NY: Holiday Valley and North America’s largest private ski area HoliMont. During the week, non-members can ski at Holimont. Check out Tripadvisor’s opinion of the best resorts in New York for skiing and snowboarding. 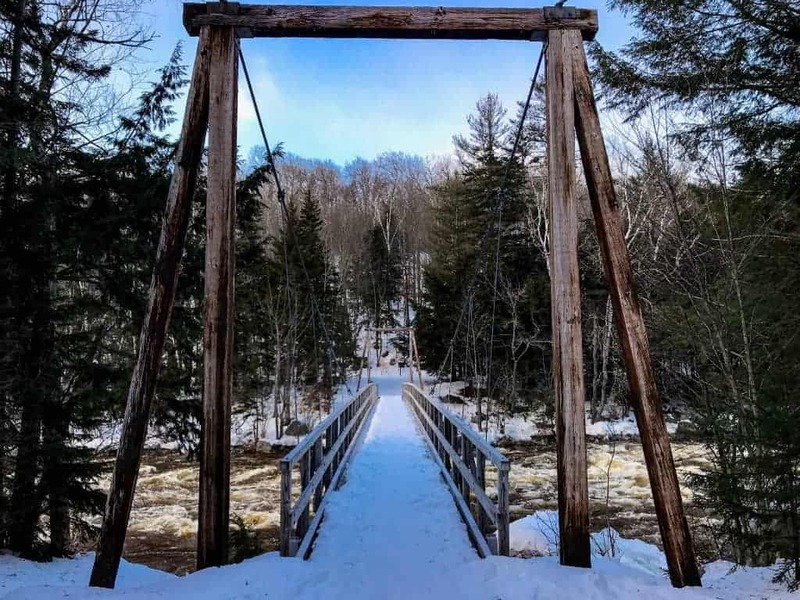 Here to give you her personal experience of Ellicottville, one of the best resorts in New York with some of the best snowboarding on the East Coast, is fellow travel blogger, Corinne McDermott at Have Baby Will Travel. We are very busy most winters with a minor hockey schedule, but when your husband’s from out west you find a way to sneak in a little ski or snowboard time. Holiday Valley in Ellicottville, New York, really surprised us. Seeing as three out of four of us are absolute beginners, Holiday Valley was the perfect place to learn how to snowboard as a family and they even have a practice chair lift to try out before going on the real deal. Holiday Valley offers group lessons for kids as young as four, but even three-year-olds can learn how to snowboard via private lessons in the Burton Riglet Park. The resort is very manageable size-wise for adult beginners who still need to parent, and there are a number of ski in/ski out chalets available for rent. We stayed in town at the Wingate, about a five-minute drive from Holiday Valley. It was a great place to warm up and crash at the end of the day, with lots of family-friendly dining options within easy walking distance, even after snowboarding all day! With 34 extensive ski areas, ski resorts in New Hampshire are geared towards both downhill skiing and/or cross country skiing. 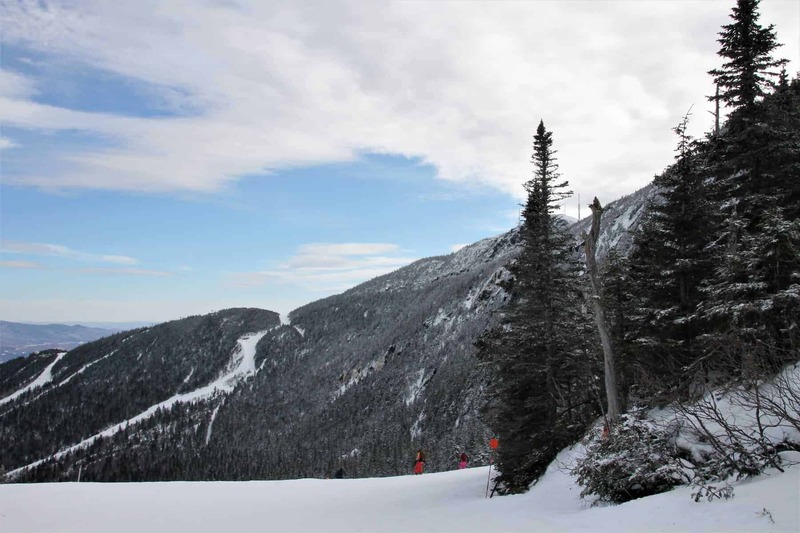 The White Mountains of New Hampshire provide some of the best ski resorts in New England. There are 20+ ski areas in New Hampshire. If you have a mixed ability group as well as those wholike both types of ski areas, New Hampshire is a good option for you. Ski resorts in New Hampshire cater for cross country skiers as well as downhill skiers. With one of the largest ski areas in New Hampshire, Bretton Woods has 97 trails over 360+ acre area, 10 lifts and 3 terrain parks. With 100km of trails, Bretton Woods is one of the best ski resorts on East Coast for cross country skiing. Located just two hours away, with two mountains over 370 acres, 61 trails and and six terrain parks, Loon Mountain is one of the best ski resorts near Boston. Loon Mountain also has miles of groomed trails for cross-country skiing. Mount Sunapee, another one of the best ski resorts near Boston, is located just 100 miles from the city and is the most southern of the ski resorts in New Hampshire. It is considered one of the best ski resorts in New England for both adults and children learning to ski. Check out Tripadvisor’s opinion of the best resorts in New Hampshire for skiing and snowboarding. Here are two fellow travel bloggers give you their thoughts of what to expect when you ski New Hampshire – at two of the best ski resorts in New Hampshire, Bretton Woods and Loon Mountain. Bretton Woods Ski Resort is located in Bretton Woods, New Hampshire and is New Hampshire’s largest ski area with over 464 acres of skiing for all experience levels. Bretton Woods is our favorite ski area in New Hampshire, with its award-winning grooming and beautiful trails. The epic view of Mount Washington while skiing is amazing. This very family friendly resort has something for the whole family with excellent day programs for the kids as well as activities for the non-skiers in the family. Bretton Woods offers gorgeous Nordic skiing, indoor rock climbing, and many more activities. If you just want to relax and enjoy the scenery, Bretton Woods has an great bar and restaurant. Skiers also get to enjoy food on trail, with an excellent mountain top restaurant on candy store on trail for those with a sweet tooth. 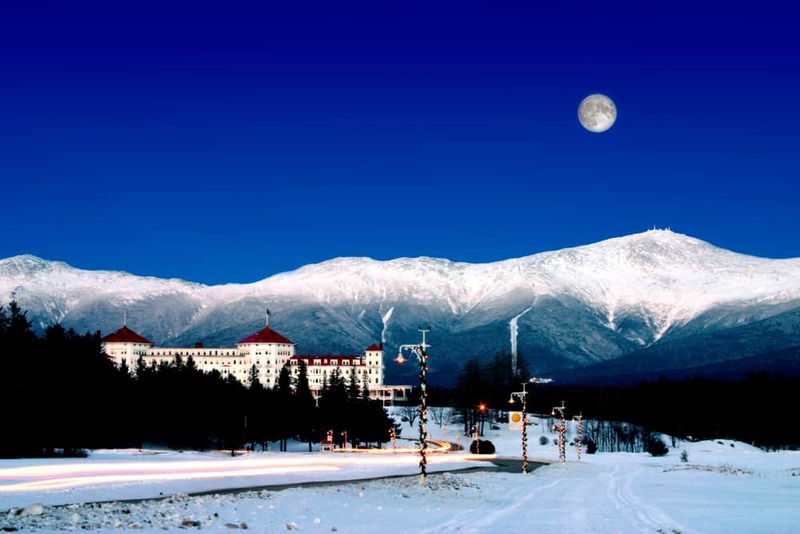 For the perfect ski getaway experience, stay at the Omni Mount Washington Resort. This historic resort is breath taking to see and is icon of New Hampshire. The food, services and extras at the Omni are the best in New Hampshire. I grew up skiing in California and Utah. I can’t say that the snow in New England is as good– smaller in quantity, colder and more likely to have ice– but there are still some fabulous places to slide down a mountain. For our family, the state of choice is New Hampshire and the mountain of choice is Loon Mountain. It is set in the perfect family ski town of Lincoln. Nearby are trails for snow shoeing, cross country skiing, indoor water parks, even Santa’s Village. Loon itself has trails for all skill levels, even a snowboarding park and a snow tubing mountain. There is also a wonderful program for handicap skiers. Child care and ski lessons are available for even the youngest. See you there on the slopes this winter! The Pocono mountains provide the backdrop for the best ski resorts in Pennsylvania. Among the ski resorts in the Pocono mountains is Tanglewood ski area, Big Boulder ski area and Camelback Resort. Blue Mountain ski resort is one of the best ski resorts for families on the east coast located a mere 90 miles from Philadelphia to approximately 110 miles from New York City. It’s got good facilities for beginners and intermediates but more advanced skiers may not find Blue Mountain challenging enough. A more advanced ski resort for families is Whitetail Resort. We have skiied ourselves from Whitetail Resort when we were visiting the Washington D.C. area. My children absolutely loved the ski school. Set over 120 acres, Whitetail has 23 runs ranging from beginners to advanced and great for a weekend of skiing. Camelback Mountain is often regarded as one of the best ski resorts in Pennsylvania, not only for itself but also because it is one of the best ski resorts near NYC. In addition to skiing, Camelback has some of the best snowboarding on the east coast as well as the largest snowtube park in the USA. Check out Tripadvisor’s opinion of the best resorts in Pennsylvania for skiing and snowboarding. I am partial to Camelback Mountain as one of the best ski resorts in PA because my brother has a weekend house nearby. Here to give a unbiased view of Camelback Mountain is fellow travel blogger, Marianne Rogerson. Camelback Mountain Resort in the Pocono Mountains is just a 2-hour drive from New York City. Although small, Camelback has a good choice of ski slopes with 37 trails ranging from green to double diamong and 10 chair lifts. There is a fun ski school for the kids, with magic carpet lifts on the nursery slopes. Thanks to more than 1200 snowmaking guns, you are guaranteed snow at Camelback. For more fun in the snow, Camelback also boasts the biggest snow tubing park in the United States! It has 42 snowtubing lanes and is a lot of fun! As it is so close to the city, Camelback can be visited as a day trip from New York City. We chose to spend three nights at the Camelback Resort, which is super family friendly, with large suites available as 1, 2 and 3-bedroom options. There’s loads of fun to be had here away from the ski slopes, with an onsite indoor water park with a wave pool and selection of water slides, a games arcade and an indoor ropes course. 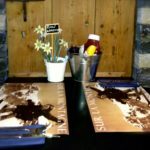 It has a choice of restaurants, including the ski-in, ski out Trails End, which is perfect for a hot chocolate (or something stronger) at the end of a hard day skiing. 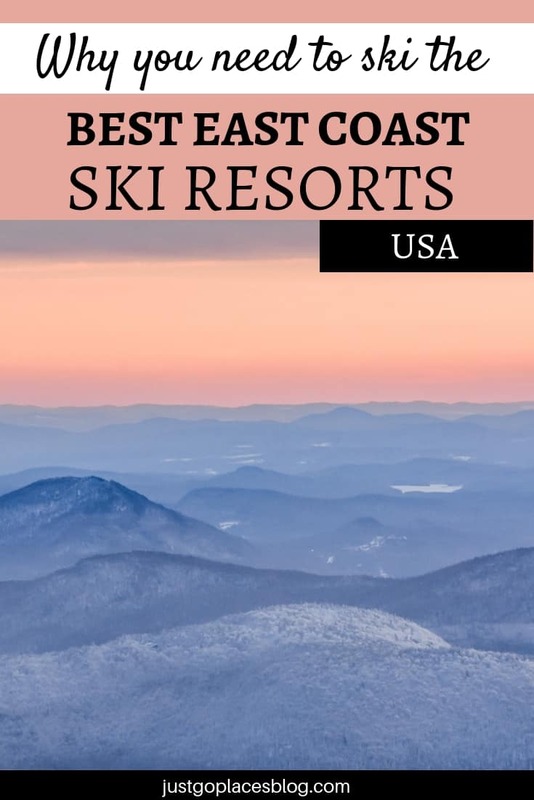 The best ski resorts in Vermont are among the best ski resorts East Coast thanks to its 20 alpine and 30 cross country ski resorts set on the state’s Green Mountains. Among Vermont’s best ski resorts are such well-known names as Mount Snow, Stratton, Killington, Smuggler’s Notch, Stowe and Sugarbush. Mount Snow is one of the best ski resorts near Boston. With approximately 590 acres, 20 lifts and 86 runs suitable for all abilities. Stratton is one of the best ski resorts for families on the east coast. Set on almost 670 acres with 99 runs, 11 lifts and 4 terrain parks, unlike many other family resorts, there is a good spread for all abilities. Check out Tripadvisor’s opinion of the best resorts in Vermont for skiing and snowboarding. Here are five fellow travel bloggers to give you their their opinion of the best Vermont ski resorts. As someone who was born and raised in New Jersey by a family who loved to ski, I’ve been lucky to experience my fair share of the east coast mountains in its best and worst conditions. There is one that will always be my favorite for various reasons and that is Killington, Vermont. 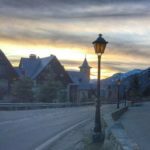 A ski town that is perfect for the advancing skier/snowboarder. The summit lies at 4,241’ with a 3050’ vertical drop and on a heavy winter season can provide up to 212 trails. You can easily spend the entire day on the mountain and not explore all its trails, opposed to some of the smaller resorts surrounding it. There is a culture in Killington that is easy to fall in love with. The trek is well worth it, expect to see familiar faces each weekend from the surrounding states. Apres is not to be missed in the main lodge and is often carried out into town. Surprisingly, music is well respected with live bands filling up the resort and local bars almost every night. When you drive down the main strip you have an abundance of mom an pop restaurants, lodging, and bars to take advantage of. They managed to make a popular resort town feel local and homie. Our favorite place to stay is the Highline Lodge for homie cabin vibes and outstanding food. Stratton ski resort in Vermont is known as the birthplace of snowboarding and is a well-designed, family friendly ski resort about 3.5 hours’ drive north of New York City. There are some high-end lodgings available on the mountain, although rooms book up well in advance during the holiday season. 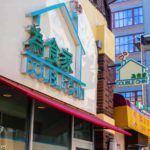 An alternative is to stay in a nearby town such as Bennington which is under an hour’s drive to the resort with more friendly prices for accommodation and meal options. The quality of snow at Stratton is excellent. Great consistent coverage and while there is no deep powder to speak of there are rarely any icy patches. The runs can all be accessed from the summit of Mount Stratton. Run range from double black diamond to green so it has terrain suitable to all levels including long wide runs allowing you to test your speed. Families are well catered for with a fully licensed child care facility for toddlers and well-credentialed and long-established ski and snowboard school for older kids and adults. For non-skiers, there is yoga, an indoor fitness centre with heated pool, or get a tour of the mountain aboard a snow mobile. Stratton Mount Resort is located in Stratton, Vermont. It is the largest mountain in Southern Vermont at 3875 feet. Stratton Resort has a very European ski village look and feel with cute shops, cafes, and restaurants. We stayed at the Black Bear Lodge which is walking distance from the slopes with a free shuttle that arrives every few minutes. We are very budget conscious and found it to be an excellent value for the money. Our trip to Stratton came very late in the season and the weather was warm and rainy, yet the snow conditions were still good. With an average snow fall of over 160 inches of snow, good conditions extend into to late Spring. Stratton has a good balance of skiing over their 670 acres of skiable terrain, with trails for every level of experience and type of skier. There are cruising trails as long as 3 miles, and over 160 acres of glades. The mix of trails is 41% novice, 31% intermediate, 17% advanced, and 11% expert. For the non-skiers in the group, there is tons to enjoy. Stratton is very family friendly and offers lots of shopping and non-ski activities. We recommend trying fat tire biking! Stowe Mountain Resort in Stowe, Vermont is the most impressive ski area we have ever visited. I couldn’t help but say wow when we entered the resort. The village has the largest amount of activities for the whole family, with shopping, dining, an outdoor ice skating center, indoor rock climbing, and an amazing day-care program for kids. For the more adventurous, try zip lining or the tree top adventure tours. We stayed at near-by at the picturesque Stoweflake Mountain Resort and Spa that has a free shuttle bus to the resort. The whole area is cute and fun. You can’t go wrong with any place in Stowe. Stowe sits on Vermont’s highest peak, Mount Mansfield (4395 feet). With amazing enclosed gondolas, it is the best ride up a mountain in New England. Getting down is even more fun. Stowe gets over 300 inches of snow every year that contribute to deep snow depths, along with their extensive snow making. Stowe has consistent reliable conditions on 40 miles of skiing for all levels of experience (Beginner 16%, Intermediate 55%, Expert 29%). 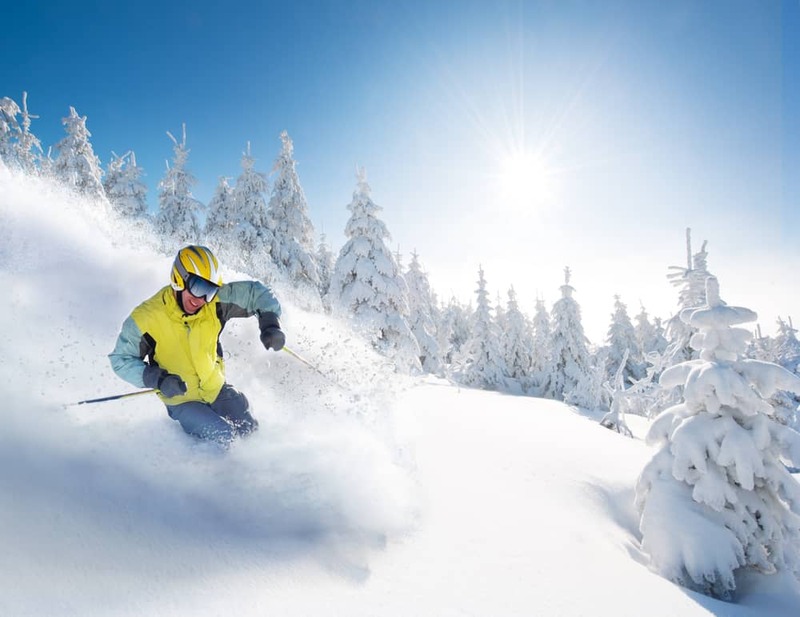 With the largest natural snowfall in northeastern United States, Jay Peak in northern Vermont offers excellent conditions for beginners to expert skiers and snow boarders. With 79 trails, 9 lifts and the only Tram in Vermont, the skill hill uses advanced snowmaking techniques to supplement their already incredible amount of natural snow to offer amazing runs, including some amazing glades. Over the past decade the ski hill has invested millions to turn the remote ski haven paradise into a world class resort. Open year-round, the resort offers something for everyone, including non-skiers, including cross country (Nordic) skiing, snowshoeing, fat biking and skating at their NHL-sized ice rink ‘Ice Haus’. At Clips & Reels you can catch a movie the kids will enjoy while having an après ski drink or check out the virtual reality games in the arcade. There is also a climbing wall for those looking for adventure in a safe environment. Note: It’s best to book climbing in advance because it books up fast. The 85-degree Pump House water park includes a 50,000 square-foot glass-enclosed water park with water slides and a retractable roof. This tropical paradise is also great for après ski with the kids. If your feeling adventurous try ‘La Chute’. Standing upright you wait for a countdown before the floor falls from beneath your feet and you fall 45 miles an hour through a chute… hence the name. Or if you are a little less adventurous enjoy a float along the lazy river or enjoy a drink at the bar overlooking the water playground. You wouldn’t think that one of the best ski resorts in the east would be as far south as West Ve=t Virginia. 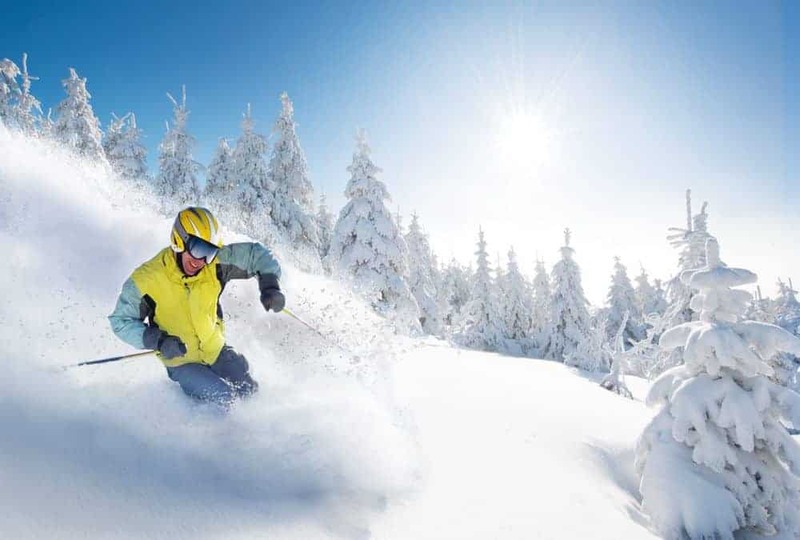 Among the best ski resorts in West Virginia are Canaan Valley Resort, Snowshoe Mountain, Timberline Four and Winterplace Ski Resort. Canaan Valley Resort is located on the highest peak east of the Rocky mountains. Set over 75 acres, Canaan Valley is compact but has 47 trails accommodating all abilities and 1 terrain park. Snowshoe Mountain is a larger resort yet equally suited for all abilities. Snowshoe is set over 250+ acres with 60 runs, 14 lifts (including 4 high speed ones) and 5 terrain parks. Check out Tripadvisor’s opinion of the best resorts in West Virginia for skiing and snowboarding. Here to give her opinion of Snowshoe Mountain Ski resort is fellow travel blogger, Tanya Prater. 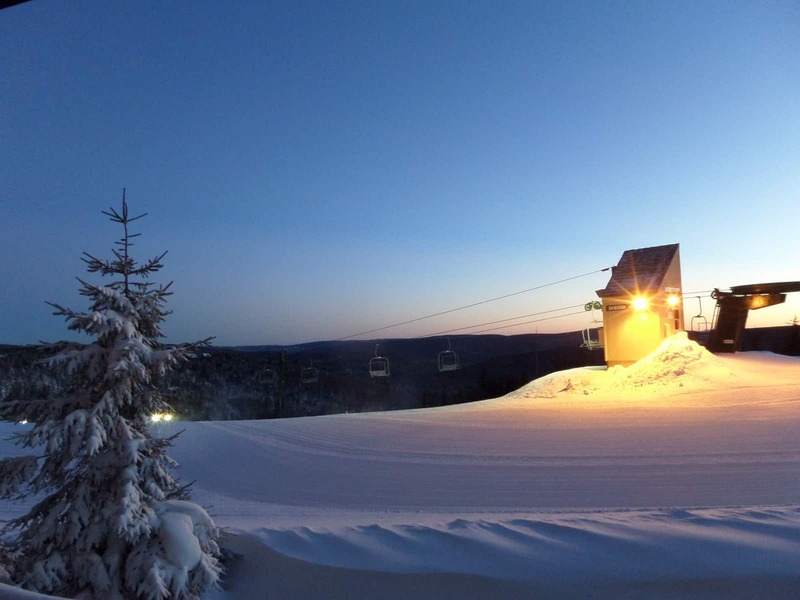 Snowshoe Mountain Ski Resort provides outdoor recreation year-round, but this property located on Cheat Mountain in the Alleghenies of West Virginia is best known for their winter offerings. Less than five hours from Washington D.C., this ski resort provides fun for the entire family, on and off the slopes. Outdoors, you’ll find 250 acres that encompass 15 lifts and 60 trails with four terrain parks and a Coca Cola tubing park, guided snowmobile tours and Polaris RZR Tours for an off-road adventure. When you need to warm up, you’ll find restaurants, shopping, a spa, teen center, 15,000 square foot playground for children that offers bounce houses, slides and an arcade, a heated Snowcat tours offered at Snowshoe Village which is located at the summit of the mountain rather than the base.